By Sister Annabel Laity The Chinese word for " liberation" is made up of two characters. According to the Dictionary, of Chinese Buddhist Terms by W. E. Soothill and L. Hodous, the characters mean " to unloose, let go, release, untie, disentangle, explain, expound." The Sanskrit words for liberation are mukti, moksha, vinmkti, and vimoksha. Mukti and moksha are translated as " loosing, release, deliverance, emancipation ." The addition of vi- means "complete," or "absolute." The three concentrations on emptiness, signlessness, and wishlessness are also called the Three Doors of Liberation. Liberation is not something which takes place when we reach the end of the road, but in every moment of our lives as we walk, work, eat, and re late to others. Liberation comes through understanding but understanding can only be when the right causes and conditions are present. When mindfulness, the Sangha, humility, openness , and the right time are available then there is a possibility for understanding. Liberation is always liberation from something. If in a moment of irritation or anger, we are able to come back to ourselves and transform that energy into something positive, that is liberation from irritat ion . As we continue to use our concentration to look deeply into the emptiness (non- self nature) of ourse lves and the other, our liberation from anger will be complete. At every moment of the day , we can li berate ourselves from fixed ideas and perceptions by using our breath to stay in the present moment and to be deeply in touch. At that moment we are practicing emptiness, signlessness, and wishlessness. Sister Annabel Laity, True Virtue, has been a resident of Plum Village since 1986. She was ordained as a nun in 1988 and as a Dharma teacher in 1990. By Jack Lawlor There are times we instinctively offer a hand to a friend, and times we reach for a helping hand. I've experienced these instincts hiking with friends through a beautiful, ancient bog, known as a fen. As urban refugees from Chicago, we come simply to enjoy the wetland beauty, hiking the trail to kayaks at a broken down dock. Like life itself, the trail offers some big surprises! If you aren't careful, your legs may penetrate the bog and you'll sink to your hips in primordial ooze! When we reach parts of the trail where I've lost legs and footwear, I instinctively help others navigate the boundary. Although my friends are ultimately capable of navigating, I offer the benefit of my experience. The instinct is the same when I help a novice into a floating kayak. The craft seems unstable until you slide in. I offer a hand to bolster my friends' confidence in their own balance and poise, and they, in tum, reach out to me. Spiritual mentoring is much the same. A true spiritual friend humbly offers the helping hand of experience. A good mentor recognizes and nourishes talents already present. The talents revealed may surprise the student! The teacher demonstrates, usually by example, how to build upon these abilities, transmitting confidence in the process. Spiritual mentoring relies upon the mentor's taking time to look deeply into a friend. The mentor's experience enables him or her to recognize the friend's aspiration to attain enlightenment and release from greed, anger, and delusion, for the benefit of self and others-in Buddhist terms what is revealed is the student's bodhichitta. Bodhichitta is inherent in everyone, and expresses itself daily, though sometimes in timid and clumsy ways. The mentor helps the student develop spiritual practice in mindful and joyfully purposeful ways. With each day of regular sitting and walking meditation, each little success in maintaining conscious breathing, our mentored friend's confidence grows and his or her bodhichitta blooms into lotus petals of innumerable helping hands. In time, the friend becomes a mentor to others. Mentoring can be especially challenging for lay Dharma teachers and lay members of the Order of Interbeing. Our daily attention is devoted to the millions of details of running a business or profession thoughtfully, the thousands of concerns of family life, the hundreds of challenges in social service and volunteer work, and the scores of items which must be tended to for a lay Sangha to thrive. Helping a novice kayaker on the dock, I may start daydreaming about these details and find myself in the water! In offering spiritual mentorship to a friend, I must, above all, let go of my projects and relationships and simply be present. The Seventh Mindfulness Training of the Order of Interbeing, Dwelling Happily in the Present Moment, may be our collective mentor! It instills confidence that we need not lose ourselves in dispersion and that mindful breathing will bring us back to the present, to what is wondrous, refreshing, and healing inside and around us. Practicing this way, every day, in the company of a spiritual friend can lead to deep transformation for both mentor and friend. The reciprocal nature of mentoring is easily overlooked. In nurturing, the mentor becomes vulnerable. My friend's problems may be unfamiliar territory to me. A good mentor admits when he or she is in unfamiliar territory. At this point, the mentor and student can learn from each other, using the considerable resources of mindfulness practice! Mentoring can be a duet where both parties learn and come to understand the needs of the other. If the mentor can be honest enough to reveal his or her needs and limitations, miscommunication and false expectations can be reduced. When I take friends through the fen to go kayaking, I don 't guarantee they won't fall in the bog, capsize, or meet their fair share of ticks. But a little care and attention boosts the confidence of even the most squeamish city person entering the wonderful world of the swamp. My friend emerges more aware of the environment and our place in it. The company of novices, seeing this waterlogged world through beginner's eyes and mind, refreshes me and leads me, too, to new discoveries. It is the same with spiritual friendship between teacher and student. Perhaps what the mentor can do best is instill confidence that calmness, clarity, and insight are possible. Sure enough, we'll tum on the non-Buddha channel now and then! But our daily return to mindfulness practices makes transformation possible. Demonstrating these practices day in, day out, in non-glamorous settings, the teacher ultimately liberates the teacher within the student. Each step of the way, the teacher refreshes his or her own experience, drinking deeply from the well of the Dharma, thanks to the genuine aspiration of the student at his or her side. Dharma teacher Jack Lawlor, True Direction, is co-director of the Order of Interbeing and author of Sangha Building. He is afounding member of the Lakeside Buddha Sangha in Evanston, Illinois. By Therese Fitzgerald After months of zazen practice at San Francisco Zen Center, I asked my teacher Richard Baker-roshi, "Do I really have to count my breath?" "Yes," he responded with unmistakable solemnity. I had friends who managed to count hundreds of breaths forwards and backwards, and others who described staying home just enjoying their breathing in zazen posture. So I kept putting myself in the "bamboo rod," as Suzuki-roshi writes in Zen Mind, Beginner's Mind--trying to learn what for me was a somewhat elusive practice. Ten years ago, I acknowledged to Thich Nhat Hanh that paying attention to my breathing was mostly an experience of getting in touch with constriction in my abdomen and chest. Thlly asked me, "Is there any time you enjoy your breathing?" I thought for a moment and responded, "Yes, when I'm floating in the ocean, in a pond, or even in the bathtub." "Why do you ever get out of the bathtub?" he asked wide-eyed, opening his palm. Now as I sit up in bed writing while my husband sleeps next to me, I realize I am enjoying my breathing alongside of his breathing. At times-sitting at my office desk looking out the window, lying under a tree, standing at the dish sink-I find myself simply and happily being conscious of my breathing. The concept and practice of stopping, samatha-stopping at the sound of the telephone bell, having a friend ask, "Are you enjoying your breathing?" or stopping for formal meditation-has helped me notice my breathing throughout the day and notice whether it is long or short, relaxed or constricted. Stretching out in the prone posture is the most conducive for my relaxed breathing, and floating in a warm body of water, especially salt water, always gives me the most enjoyable breathing experience. And then there are times when I have really needed to "take refuge in the island of self' by practicing conscious breathing. This practice was my constant companion, for example, throughout the ordeal of my beloved brother's recovery from a brain injury accident, starting with six weeks in a coma. The breath proved to be my strongest link with the present moment. By returning to my breath when any thoughts of the past or the future could have overwhelmed me, I nurtured my strength to stay with my brother through the coma- which was fairly unnerving, as he was both completely familiar to me and yet far, far away in another universe. Walking meditation in the halls of the neuro-unit sustained me in my contact with less-than sensitive medical staff and anxious visitors. I remember one visitor pleading with me, "Tell me it's gonna be all right." I breathed and spoke from a place of calm conviction, "He's alive. Let's be grateful and be with him as he is right now." I had to leave midway through the coma, knowing that it would be several weeks before I could see my brother again. My father and I had just visited a facility for severely-damaged brain injury survivors. As I entered my brother's hospital room, I was choked up with sorrow and dread. Tears threatened to disable me from sitting by his side and helping him as he struggled to tear at the feeding tube. I called on the practice of putting breath to song and sang "Breathing In, Breathing Out" with as much spirit as I could gather. My calm was restored, and my sister, who arrived to take care of my brother, was heartened. Years later, I continued to process the lessons from this experience. While practicing walking meditation at Plum Village one year after the accident, my sadness almost overwhelmed me. I remembered Thay's advice to me just months after the accident when I found it difficult to practice walking meditation on the beautiful streets of Prague, as all I could think of was my brother's inability to walk at the time. Thay had responded, "Walk for your brother." As we started out on the path along the Plum Village sunflower fields, I poured my loving concentration for my brother into each step, while I maintained awareness of my breathing. A song/mantra emerged from that walk which expresses what I continue to learn from the radical awakenings my brother opened up for me: I didn't know how precious life is, until I saw you lying there. I must have forgotten how precious life is, and then I saw you lying there. I couldn't believe how precious life is, as I watched you lying there. And then I practiced taking care, taking care of you lying there. And now I know how precious life is, how very precious life is. I tum to this mantra when I need to come back to my breathing and deepen my perspective. It seems so simple: mindful breathing helps us be present for the preciousness of life. The trick is "remembering to remember" the practice that helps us stay present. We help ourselves by carving out time to sit and walk mindfully every day to develop the "habit" of stopping and being with the breath. And yes, counting the breath, gatha practice, guided meditations, or some other means of being fully aware of our breathing, can be the vehicle which facilitates our practice so that it is there for us to call on when we need it. Dharma teacher Therese Fitzgerald, True Light, practices swimming meditation and mindful breathing in any body of water above freezing. By Leslie Rawls Editing this issue of The Mindfulness Bell, I have been able to focus on my breath as a reality, not as a habit. The habit is when the bell rings, I stop and breathe, counting my breaths. If I'm not with my breathing, stopping and counting is empty recitation-like children saying the Lord's Prayer without understanding the meaning. On occasion, I have been aware that I want to count my breath and get back to work. That's just counting; it's not breathing. I become aware of the urge to get it over, and that helps me come back to real awareness. Working with these articles has helped me remember what a gift it is for the phone to ring or the computer bell to chime. Not because it takes me away from work, but because it reminds me to breathe mindfully. When I am truly present, my conscious breathing extends beyond the sound of the bell. I am able to carry it steadily. I am grateful for my breathing because when I practice conscious breathing deeply, it brings me into this moment. And, a half-smile really does bloom on my face effortlessly. Leslie Rawls, True Enlightenment Country, lives in Charlotte, North Carolina. By Adele Macy Breathing in, I calm my body. Breathing out, I smile. Dwelling in the present moment, I know that this is a wonderful moment! Thay's words seem so simple. At times, reading such simple words, I find myself searching for some extraordinary revelation. This intellectual hunger usually crops up when I feel overwhelmed by life's responsibilities and emotional demands. Then, I enjoy retreating to my room to ponder the riddles of the masters or read a good novel. I find great value in studying the Dharma, not being content with the comfortable grooves in my mind that think the ordinary is nothing extraordinary. Times of quiet study are like an in-breath before the out-breath of busy activity. These days, I have no books or poetry to protect me from the reality of having my critically-ill brother living with me. Charlie is suffering from every kind of lung disease imaginable plus several other serious and very painful ailments. I have had to put away my books and my "best laid plans," and practice deep listening and compassion for a person whose every shallow breath is a challenge. Charlie has been pumped full of steroids for years just to stay alive. He is now at a stage where he is ready to let go, but doesn't quite know how. Charlie enjoys simple things, like watching me cook my exotic dishes and especially eating them. He laughs, watching out the window as our very determined basset hound pulls me down the street on our daily walk. He loves laughter and has a beautiful laugh that's rich and wholesome. Many days, Charlie forces himself to laugh; he knows it's better than any medicine. He grieves the loss of his 14-year companion, Lena, who recently died of lung cancer and the quick passage of their short journey together, spent hard and fast. Recently, I took Charlie up the Blue Ridge Parkway-a glorious stretch of road winding through the North Carolina mountains. Charlie could not enjoy it, though he tried. His vision is going, and he couldn't see the beautiful fall colors covering the mountains. Everything is a blur to him. On the way home, he broke down sobbing and told me that he felt like a mountain was sitting on top of him. Breathing in, I calm my body. Breathing out, I smile. Dwelling in the present moment, I know this is a wonderful moment. I can do the first part, but when I'm with Charlie, sometimes the smiling is difficult. I can breathe deeply, aware of the transforming effect, the peaceful joy of this body that lives, this blood that courses with the rhythm of all things. Why must my brother be deprived of this essential gift? How can he find this peace? A couple of weeks ago I went on my monthly retreat in the mountains. I woke at 6:30, not wanting to waste a moment of this precious time. I had only one day before returning home to Charlie, who can't walk five feet without having to sit down and rest. I kept busy all morning, building my fire, preparing breakfast, and straightening up. I reminded myself to stop and smell and listen and watch, but only for a minute because things weren't quite right for zazen. My Christian background led me once to a little book called The Practice of the Presence of God by Brother Lawrence, a monastery cook. At times when the bell rang for prayers and chanting in the chapel, Brother Lawrence continued working in the kitchen. When asked why he didn't attend the sacred rituals, Brother Lawrence replied, "It makes no difference whether I am here cooking or in the chapel. God is present in all things at all times." That book was my first lesson in mindfulness. Thay, like Brother Lawrence, reminds me that awareness is a moment-by-moment process that nurtures deep joy and compassion. I remind myself that there is no preparation required for deep listening. Preparing my breakfast is deep listening. If I put my ear to the ground, I can hear the earth's heart beating. The spaces between all things are breaths. The spaces between words, the coursing of the river, the whispering leaves moving to the great breath of the wind. All is air and movement and cells multiplying between breaths. Even the imaginary line I draw between myself and others is a breath. My brother cannot breathe with ease, hike in the woods, or bend to the ground to listen to the earth's heart beating. If I breathe mindfully when I'm with him, maybe I'll hear the river moving in his labored lungs. Maybe if we both listen, old Grandfather Tree, our childhood friend, will remind us that even the slow-running sap of the old, tired tree nourishes the leaves that feed the soil that catches the rain that fills the liver that rests in a pool where a child drinks. Breathing in, I calm my body. Breathing out, I smile. Dwelling in the present moment, I know that this is a wonderful moment! Such profound wisdom in those simple words. Adele Macy, Liberation of the Source, works with elderly people and practices with the Charlotte Community of Mindfulness in North Carolina. we sitstill on cushions, pillows, or pads. we hear stomachs grumble, crows call, heaters switch on, heaters switch off, clocks tick, trees grow. while a soft voice reminds us who we really are our minds romp about the day, or long to curl up on our cushions and sleep. still we sit one year later none of us quite sure, then, of what is this Sangha. we still sit relearning who we are when we are not our personalities. knowing we need a kindred circle to touch this sparkling moment. Report from Sonoma, April 1995 At the bank a week after the shooting it's business as usual; you couldn't tell any but daily life has ever gone on here. That night I heard about it: felt only shutting down, a muffled distant metal chung!, and nothing, not free to be impressed by death nor life, nothing; but in the next days, found I couldn't walk near: a force of sadness larger than two men I didn't know bound me like a spell. In time, my own dead made their ways through to say at last, ''Nothing you need do for us. Keep going." I went to the woods where I grew up one last time too many. Last fall this was. The woOds are gone, completely gone. Once tweilty miles out, not changed in thirty years, sudclenly cedars and hucklebenies, beaver ponds, bo~ and deer trails, the riches of my first world, gone to housing tracts, middle-class streets, poles, wires, lawns, people from somewhere else having no idea what was there; all gone. They were babies; now they need a place to live. In the winter I went back to Binh Dinh province, to my old AO, to the place where the sounds come from that;charge my ears with trouble out of time. I went to say goodbye to ghosts of men I'll always love, but can no longer carry. I found no trace, no ghosts, no floating memories of the spirit we lived in then; found everything above and below that ground under vigorous use of the ones who live there now. The fugitive past I went to meet is bqried and put to rest under twenty-five years of busy life. It's been that long. Can't take nor bring any of it back, can only be in present tense must live, must continue living daily. It's alright. Reprinted from What Book!? (Parallax Press, 1998). Ted Sexauer is a member of the Veteran Writer's Workshop, West Coast Group, which meets quarterly at Sebastopol, California. 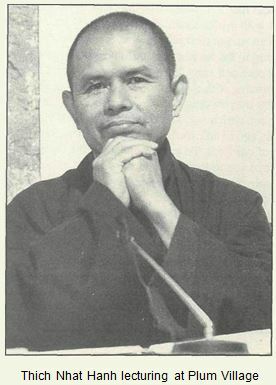 By Thich Nhat Hanh I would like to speak a little bit about Heaven, or Paradise, and Hell. I have been in Paradise and I have also been in Hell. I think if you remember well, you know that you too have been in Paradise, and you have been in Hell. There is a collection of stories about the lives of the Buddha, The Jataka Tales. Among these hun­dreds of stories, I remember one very vividly about a former life of the Buddha. In this story, the Buddha was in Hell. Before he became a Buddha, he had suffered a lot in many lives. Like all of us, he made a lot of mistakes. He made himself suffer, and he made people around him suffer. Sometimes he made very big mistakes. The Buddha had done something wrong and caused a lot of suffering to himself and to others. So he found himself in the worst of all Hells. Another man was in Hell with the Buddha. Together they had to work very hard, under the direction of a guard who did not seem to have a heart. The guard did not seem to know anything about suffering. He did not know about the feelings of other people, and he beat up the two men. It seemed his task was to make them suffer as much as possible. I think the guard also suffered a lot. It looked like he didn't have any compassion within him. It looked like he didn't have any love in his heart. It looked like he did not have a heart. When looking at him, when listening to him, it did not seem that one could contact a human being because he was so brutal. He was not sensitive to other people's suffering and pain. The guard had a weapon with three iron points. Every time he wanted the two men to work harder, he pushed them on the back with the points, and of course, their backs bled. The guard did not allow them to relax; he was always pushing, pushing, pushing. But he also looked like he was being pushed. Have you ever felt that kind of pushing? Even if there was no one behind you, you felt pushed to do things you don't like to do, and to say things you don't like to say. And in doing these things, you created a lot of suffering for yourself and the people around you. Sometimes we say and do horrible things that we did not want to say or do. Yet we felt pushed by something, so we said it, we did it, even if we didn't want to. That was what happened to the guard in Hell; he pushed, because he was being pushed. He caused a lot of damage to the two men. They were very cold and hungry, and he was always pushing and beating them. When I read this story, I was very young, seven years old. And I was astonished that even in Hell, there was compassion. That was a very relieving truth: even in Hell there is compassion. Can you imagine? The other man saw the Buddha die, and for the first time he was touched by compassion. He saw that the other person must have had some love, some compassion to have the courage to intervene for his sake. Compassion arose in him also. He looked at the guard, and said, "My friend was right, you don't have a heart. You only create suffering for yourself and for other people. I don't think that you are a happy person. You have killed him." The guard became very angry with him also, and he planted the weapon in the second man's stomach. He too died right away and was reborn as a human being on Earth. Both of them escaped Hell, and had a chance to begin anew on Earth, as full human beings. What happened to the guard, who had no heart? He felt very lonely. In that Hell, there had been only three people, and now the other two were dead. He began to see that to live with other people is a wonderful thing. Now the two other people were dead, and he was utterly alone. He could not bear that kind of loneliness, and Hell became very difficult for him. Out of that suffering, he learned that you cannot live alone. Man is not our enemy. You cannot hate man, you cannot kill man, you cannot reduce man to nothingness, because if you kill man, with whom will you live? He made a vow that if he had to take care of other people in Hell, he would learn to deal with them in a nicer way, and a transformation took place in his heart. In fact, he did have a heart. Everyone has a heart. We just need something or someone to touch that heart. So this time the feeling of loneliness and the desire to be with other humans were born in him. Suddenly, the door of Hell opened, and a radiant bodhisattva appeared. The bodhisattva said, "Good­ness has been born in you, so you don't have to endure Hell very long. You will die quickly and be reborn as a human very soon." When I was seven, I did not understand the story fully, but it had a strong impact on me. I think it was my favorite Jataka tale. I found that in Hell, there could be compassion. It is possible for us to give birth to compassion even in the most difficult situations. In our daily lives, from time to time, we create Hell for ourselves and for our beloved ones. The Buddha had done that several times before he became a Buddha. He created suffering for himself and for other people, including his mother and his father. That is why, in a former life, he had to be in Hell. Hell is a place where we can learn a lesson and grow, and the Buddha learned well in Hell. After he was reborn as a human, he continued to practice compassion. From that day on, he continued to make progress in the direction of understanding and love, and he has never gone back to Hell again, except when he wanted to go there and help the people who suffer. I have been in Hell, many kinds of Hell, and I have seen that even in Hell, compassion is possible. With the practice of Buddhist meditation, you may very well prevent Hell manifesting, and if Hell has already manifested, you have ways to transform Hell into something much more pleasant. When you get angry, Hell is born. Anger makes you suffer a lot, and not only do you suffer, but the people you love also suffer at the same time. When we don't know how to practice, from time to time we create Hell in our own families. Hell can be created by Father, Mother, Sister, or Brother. You have created Hell many times in your family, and every time Hell is there, other people suffer, and you also suffer. So how to make compas­sion arise in one of you? I think the key is practice. If among three or four people, one person has compas­sion inside and is capable of smiling, breathing, and walking mindfully, she or he can be the savior of the whole family. He or she will play the role of the Buddha in Hell. Because compassion is born in him first, compassion will be seen and touched by some­one else, and then, by someone else. It may be that Hell can be transformed in just one minute or less. It is wonderful! Joy and happiness are possible, and if we are able to practice mindfulness, we will be able to make life much more pleasant in our family, our school and work, and our society. Dear friends, the energy that pushes us to do what we do not want to do and say what we do not want to say is the negative habit energy in us. In Sanskrit, the word is vasana. It is very important that we recognize habit energy in us. This energy has been transmitted to us by many generations of ancestors, and we continue to cultivate it. It is very powerful. We are intelligent enough to know that if we do this or say that, we will damage our relation­ship. Yet when the time comes, we say it or we do it anyway. Why? Because our habit energy is stronger than we are. It is pushing us all the time. The practice aims at liberating ourselves from that kind of habit energy. I remember one day when I was sitting on the bus in India, with a friend, visiting Untouchable commu­nities. I was enjoying the beautiful landscape from my window, but when I looked at him, I saw that he looked very tense. He was struggling. I said, "My dear friend, there is nothing for you to worry about now. I know that your concern is to make my trip pleasant, and to make me happy, but you know, I am happy right now, so enjoy yourself. Sit back. Smile. The landscape is very beautiful." He said, "Okay," and sat back. But when I looked back two minutes later, he was as tense as before. He was still strug­gling. He was not capable of letting go of the struggle that has been going on for many thousands of years. He was not capable of dwelling in the present moment and touching life deeply in that moment. He has a family, a beautiful apartment, and a good job, and he does not look like an Untouchable, but he still carries all the energies and suffering of his ancestors. They struggle during the day; they struggle during the night, even in dreams. They are not capable of letting go and relaxing. Our ancestors might have been luckier than his were, but many of us behave very much like him. We do not allow ourselves to relax, to be in the present. Why do we always run, even when we are eating, walking, or sitting? Something is pushing us all the time. We are not capable of being free, of touching life deeply in this very moment. You make yourself busy all of your life. You believe that happiness and peace are not possible in the here and the now, but may be possible in the future. So you use all your energy to run to the future, hoping that there you will have happiness and peace. The Buddha addressed this issue very clearly. He said, "Do not pursue the past. Do not lose yourself in the future. The past no longer is. The future has not yet come. Looking deeply at life as it is in the very here and now, the practitioner dwells in stability and freedom." The Buddha said that living happily in the present moment is possible: drsta dharma sukha vihari. Drsta dharma means the things that are here, that happen in the here and the now. Sukha means happiness. Vihari means to dwell, to live. Living happily in the present moment is the practice. But how do we liberate ourselves in order to really be in the here and the now? Buddhist meditation offers the practice of stopping. Stopping is very important, because we have been running all our lives, and also in all our previous lives. Our ancestors ran, and they continue to run in us. If we don't practice, then our children will continue to run in the future. So we have to learn the art of stopping. Stop running. Stop being pushed by that habit energy. But first, you must recognize that there is such an energy in you, always pushing you. Even if you want to stop, it doesn't allow you to stop. At breakfast, some of us are capable of enjoying our meal, of being together in the here and the now. But many of us are not really there while having our breakfast. We continue to run. We have a lot of projects, worries, and anxieties, and we cannot sit like a Buddha. The Buddha always sits on a lotus flower, very fresh, very stable. If we are capable of sitting in the here and the now, anywhere we sit becomes a lotus flower, because you are really sitting, you are really there. Your body and your mind together, you are free from worries, regrets, and anger. Though each of us has a cushion during sitting meditation, the cushion can be Heaven or Hell. The cushion can be a lotus flower or the cushion can be thorns. Many of us sit on the cushion, but it's like sitting on thorns. We don't know how to enjoy the lotus flower. Our joy, our peace, our happiness depend very much on our practice of recognizing and transforming our habit energies. There are positive habit energies that we have to cultivate, there are negative habit energies that we have to recognize, embrace, and transform. The energy with which we do these things is mindfulness. Mindfulness helps us be aware of what is going on. Then, when the habit energy shows itself, we know right away. "Hello, my little habit energy, I know you are there. I will take good care of you." By recognizing this energy as it is, you are in control of the situation. You don't have to fight your habit energy. In fact the Buddha does not recommend that you fight it, because that habit energy is you and you should not fight against yourself. You have to generate the energy of mindful­ness, which is also you, and that positive energy will do the work of recognizing and embracing. Every time you embrace your habit energy, you can help it transform a little bit. The habit energy is a kind of seed within your consciousness, and when it becomes a source of energy, you have to recognize it. You have to bring your mindfulness into the present moment, and you just embrace that negative energy: "Hello, my negative habit energy. I know you are there. I am here for you." After maybe one or two or three minutes, that energy will go back into the form of a seed. But it may re-manifest later on. You have to be very alert. Every time a negative energy is embraced by the energy of mindfulness, it will no longer push you to do or to say things you do not want to do or say, and it loses a little bit of its strength as it returns as a seed to the lower level of consciousness. The same thing is true for all mental formations: your fear, your anguish, your anxiety, and your despair. They exist in us in the form of seeds, and every time one of the seeds is watered, it becomes a zone of energy on the upper level of our consciousness. If you don't know how to take care of it, it will cause damage, and push us to do or to say things that will damage us and damage the people we love. Therefore, generating the energy of mindfulness to recognize, embrace, and take care of negative energy is the practice. And the practice should be done in a very tender, nonviolent way. There should be no fighting, because when you fight, you create damage within yourself. The Buddhist practice is based on the insight of non-duality: you are love, you are mindfulness, but you are also that habit energy within you. To medi­tate does not mean to transform yourself into a battlefield with right fighting wrong, positive fighting negative. That's not Buddhist. Based on the insight of nonduality, the practice should be nonviolent. Mind­fulness embracing anger is like a mother embracing her child, big sister embracing younger sister. The embrace always brings a positive effect. You can bring relief, and you can cause the negative energy to lose some of its strength, just by embracing it. A practitioner has the right to suffer, but does not have the right not to practice. People who are not practitioners allow their pain, sorrow, and anguish to overwhelm them, to push them to say and do things they don't want. We, who consider ourselves to be practitioners, have the right to suffer like everyone else, but we don't have the right not to practice. We have to call on the positive things within our bodies and our consciousness to take care of our situations. It's okay to suffer, it's okay to be angry, but it's not okay to allow yourself to be flooded with suffering. We know that in our bodies and our consciousness, there are positive elements we can call on for help. We have to mobilize these positive elements to protect ourselves and to take good care of the negative things that are manifesting in us. What we usually do is call on the seed of mindful­ness to manifest as a zone of energy also, which we will call "energy number two." The energy of mindfulness has the capacity of recognizing, embracing, and relieving the suffering, calming and transforming it. In every one of us the seed of mindfulness exists, but if we have not practiced the art of mindful living, then that seed may be very small. We can be mindful, but our mindfulness is rather poor. Of course, when you drive your car, you need your mindfulness. A minimum amount of mindfulness is required for your driving; otherwise you will get into an accident. We know that every one of us has the capacity of being mindful. When you operate a machine, you need a certain amount of mindfulness, otherwise, you will have un accident de travail (an industrial injury). In our relationship with another person, we also need some amount of mindfulness; otherwise we will damage the relationship. We know that all of us have some energy of mindfulness, and that is the kind of energy we need very much to take care of our pain and sorrow. Mindfulness is something all of us can do. When you drink water and you know that you are drinking water, that is mindfulness. We call it mindfulness of drinking. When you breathe in and you are aware that you are breathing in, that is mindfulness of breathing, and when you walk and you know that you are walking, that is mindfulness of walking. Mindfulness of driving, mindfulness of ... , you don't need to be in the meditation hall to practice mindfulness. You can be there in the kitchen, or in the garden, as you continue to cultivate the energy of mindfulness. Within a Buddhist practice center, the most important practice is to do everything mindfully, because you need that energy very much for your transformation and healing. You know you can do it, and you will do it better if you are surrounded by a community of brothers and sisters who are doing the same things as you are. Alone you might forget, and you might abandon your practice after a few days or a few months. But if you practice with a Sangha, then you will be supported, and your mindfulness will grow stronger every day, thanks to the support of the Sangha. When we practice mindfulness as an art of daily living, the seed of mindfulness in our store con­sciousness becomes very strong. Anytime we touch it or call on it for help, it will be ready for us, just like the mother who, although she is working in the kitchen, is always ready for the baby when the baby cries. Mindfulness is the energy that helps us know what is going on in the present moment. When I drink water, I know that I am drinking the water. Drinking the water is what is happening. When I walk mindfully, I know that I am making mindful steps. Mindfulness of walking. I am aware that walking is going on, and I am concentrated in the walking. Mindfulness has the power of bringing concentra­tion. When you drink your water mindfully, you are concentrated on your drinking. If you are concen­trated, life is deep. You can get more joy and stability just by drinking your water mindfully. You can drive mindfully, you can cut your carrots mindfully, and when you do these things mindfully, you are concen­trated. You live deeply each moment of your daily life. Mindfulness and concentration will bring about the insight that we need. If you don't stop, if you don't become mindful, if you are not concentrated, then there is no chance that you can get insight. Buddhist meditation is to stop, to calm yourself, to be concentrated, and to direct your looking deeply into what is there in the here and now. The first element of Buddhist meditation is stopping, and the second element is looking deeply. Stopping means not to run anymore, to be mindful of what is happening in the here and the now. Mindfulness allows you to be in the here and the now, with body and mind united. In our daily lives, often our body is there, but our mind is in the past or the future, caught in our projects, our fear, and our anger. Mindfulness helps bring the mind back to the body, and when you do that you become truly present in the here and the now. Mindfulness is the energy that helps you to be fully present. If you are fully present, with your mind and body truly together, you become fully alive. Mindfulness is that energy that helps you be alive and present. You have an appointment with life—you should not miss it. The time and the space of your appoint­ment is the here and the now. If you miss the present moment, if you miss the here and the now, you miss your appointment with life, which is very serious. Learning to come back to the present moment, to be fully present and alive, is the beginning of medita­tion. Since you are there, something else is also there: life. If you are not available to life, then life will not be available to you. When you stand there with friends, contemplating the rising moon, you need to be mindful, you need to be in the here and the now. If you allow yourself to get lost in the past or the future, the full moon is not for you. If you know how to practice mindful breathing, you can bring your mind back to your body and make yourself fully present and fully alive. Now, the moon will be for you. With the practice of mindfulness, you stop running, because you are really there. You stop being carried by your habit energy, by your forgetfulness. And when you touch something beautiful with mindfulness, that something becomes a refreshing and healing element for you. With mindfulness, we can touch the positive things and we can also touch the negative things. If there is joy, mindfulness allows us to recognize it as joy. Mindfulness helps us profit from that joy and allows it to grow and help us in the work of transformation and healing. Of course, there are negative things within us and around the world. Mindfulness will help us to recognize and embrace them, bringing some relief. If you continue to look deeply into the nature of your pain, of the pain of the world, insight will come, about how that pain came to be. Insight always liberates us, but there will be no insight without mindfulness and concentration. Mindfulness pro­duces your true presence, produces life, and helps us with nourishment and healing. Mindfulness helps bring relief. Every time we embrace our pain and our sorrow with mindfulness, we always bring relief. This article was adapted from a Dharma talk given in PIum Village on August 6, 1998. Photo courtesy of Plum Village. Practicing with Lotus Buds Sangha on Wednesday nights has become a sacred ritual in my life. My spirit is nourished by the Dharma talks. The quiet sitting and walking meditation with my sisters and brothers firmly grounds me and helps me be present to myself and others. We all struggle at times to find meaning in "simply" being alive, in our breath, in our daily interactions with each other. Yet at some point, all of us have experienced the joy of being in the present moment, letting go of the past, and not being pulled into the future. The importance of being in the present moment is also part of the Christian tradition. In the Gospel according to Matthew, Jesus says, "Do not worry about tomorrow, tomorrow will take care of itself." I have found this lesson to be deceptively simple, and so difficult to learn. How many times have I been obsessed with the "destination" and failed to understand that on the journey, I am already there? Humming "/ have arrived, I am home, In the here and in the now" helps me feel grounded in the present. As a child, I was baptized into the Catholic Church. My formative years were spent in Austria, a Catholic country. I was sent to the local school, for all intents and purposes, a Catholic school. We prayed in the morning, were taught religious education by the parish priest and the nuns, took part in church-run activities for children, sang in the church choir, and went to mass on Sunday. Life revolved around the parish church and I was happy. But in my teenage years, I began to question the need for organised religion. All I could see was the church's many mistakes. I saw the church as a bastion of repression; I failed to see that within the tradition, there were also people working for justice and peace. By my mid-teens I only went to church to see the boys I fancied. In the vernacular of the time, "We went to church to search." After 22 years, I have returned to church to search, but this time, it is a different kind of search—a search for my spiritual roots, stillness, meaning and fellowship. The Wednesday night meditation sessions and retreats have offered me stillness, meaning, and fellowship, but deep down, I was cut off from my roots. What motivated me most strongly to take that first tentative step was the celebration of Christmas, which in the Catholic tradition is filled with joy, wonder, and the most beautiful rituals. My three-year-old daughter was old enough to want to understand Christmas, yet this society offered her only a shopping mall experience. So, I took her to church. The sixth Earth Touching: In gratitude and compassion, I bow down to my ancient spiritual roots. I see myself as a child, sitting in church or synagogue, ready for the sermon or ceremony—Yom Kipper, Holy Communion. I see my priest, pastor, minister, rabbi, and the people of the congregation. I remember how difficult it was to be there and to do things I did not understand or want to do. I know communication was difficult, and I did not receive much joy or nourishment from these services. I felt anxious and impatient. Because of the lack of communication and understanding between my spiritual family and me, I left my rabbi, my pastor, my synagogue, my church. I lost contact with my spiritual ancestors, and became disconnected from them. Now I know there are jewels in my spiritual tradition, and that the spiritual life of my tradition has contributed greatly to stability, joy, and peace of my ancestors for many generations. I know those who practice my spiritual tradition were unsuccessful in transmitting it to me, to us. I want to go back to them to discover the great spiritual values in my tradition, for my own nourishment and the nourishment of my children and their children. I want to connect again with my ancient spiritual ancestors and get their spiritual energy flowing freely to me again. I see Moses, Jesus, and so many others as my spiritual ancestors. I see teachers over many generations in these traditions as my spiritual ancestors, and I bow n to all of them in the present moment. Bowing down deeply and letting these words touch my heart, I have been able to take another step along my path and open my heart to the Catholic Church. What surprised me most, however, was that the church was there ready to receive me. I was rather apprehensive that first time I returned. In the beginning, I sat self-consciously, aware that I had forgotten much of the ritual. Then I let go and listened. I saw people get up and read from the Bible. The priest read from the Gospel and then brought it alive by making it relevant to our lives. There were clear parallels between what he was doing and the Dharma talks on Wednesday nights. Coming from different traditions, both were giving the same message. I could not help but express my gratitude to Father John afterwards. Since then, I have gone regularly to church while continuing with the Wednesday night meditation. One never fails to enrich the other. I am still not fully reconciled with the Catholic Church, but I have faith that this reconciliation will take place in the not-too-distant future. Thanks to the Buddha's teachings, I have been able to make an important step, but still the journey remains. May each of my footsteps be grounded in the present. May I walk the path with peace in my heart. Viktoria Rendes, Stability of the Source, lives in Australia. She practices with the Lotus Buds Sangha.